The great Sufi sage and poet Rumi, has a poem which perfectly captures why I am drawn to do Solitary retreat. Seek the Wisdom that will untie your knot. Seek the path that demands your whole being. Seek that which is, but is not apparent. The knot Rumi speaks of, is the very deeply ingrained belief in a separate self. We all share this belief, and it’s at the heart of all the problems we face in the world today. His Eminence Chagdud Tulku Rinpoche, my root Lama, whom I had the great privilege of living with and serving for two years, would tell us we were suffering from MeMineitis, a very serious disease in that it causes so much suffering. The path Rumi speaks of, which demands your whole being is of course a very personal choice that one must make. For me that path has been Vajrayana Buddhism, and Dzogchen, with Hatha Yoga and Kashmir Saivism as adjunct aspects of the adventure. I began my journey to an experience of Freedom at 15 when I experienced psychedelics for the first time. This began a lifelong inquiry into the nature of Reality and my place in it. I became a student of Swami Satchidananda at 16 which fostered my love affair with Yoga and its varied practices. At 19 I took refuge in the Mahayana vehicle of Buddhism as a Zen practitioner. At 21 I began an inquiry into Cristian Mysticism, which informed much of my parenting years until at age 40, disillusioned with my life as a householder, I picked up the book, “Gates to Buddhist Practice”, by His Eminence Chagdud Tulku Rinpoche and received a very powerful “Shaktipat” or transmission which changed my perception of reality forever. I knew in that moment I had found the Truth and the teacher I had been looking for my whole life, and that I must meet him and become his disciple. It turned out he was only 80 miles east of Arcata, where I lived at the time, in Junction City, at Chagdud Gompa Rigzdin Ling. I took refuge in the Vajrayana in 1996 with Rinpoche’s lineage holder Lama Padma Drimed Norbu, who is my current teacher, and began my journey on the very beautiful and powerful path of Vajrayana Buddhism. I bring all this to the fore as a means of explaining that solitary retreat took me 19 years of dedicated practice to come to. One certainly doesn’t need to wait that long, but for me that’s how it unfolded. I do think it helped me immensely to have a lot of life experience and years of working through my “stuff” under my belt, as well as the blessings of receiving empowerment and teachings from many great masters including His Holinesss the Dalai Lama. These aspects of my life allowed me to drop into the practice of sitting in open awareness without a chorus of doubters within me asking questions like, ” why do I have to be alone?, what’s the point of all this?, this is boring, when are we going to do something interesting? “. Without a firm foundational understanding of the Path I had chosen, these voices could easily have distracted me from the fruits of the practice. I feel that my life experiences also helped me to understand the need for the involvement of ones entire being. That brings us to “leave that which is not, but appears to be”. Here Rumi is speaking of the process of withdrawal from “normal” life in favor of the ability to “seek that which is, but is not apparent”. For thousands of years people of many different traditions have left their normal lives to do retreat with the desire to uncover a deeper Truth. In Tibet, a three years, three months, three weeks, retreat is “de rigeur” for anyone seriously seeking enlightenment. Retreat gives one the opportunity to “leave that which is not, but appears to be” in order to experience “that which is, but is not apparent”. What is being spoken of as “that which is not, but appears to be”is our misunderstanding of our experience of Reality. This is alluded to in the Zen koan “nothing is as it seems, nor is it otherwise”. We know through the discoveries of quantum physics that what we see and experience as solid is actually not solid at all but filled with space. It is our doors of perception and the socially agreed to relationship to those perceptions that give us the experience of “solid” reality. Through spiritual practice it is possible to experience the source of all that we see as a dynamic display of Awareness itself. This experience is known as enlightenment, awakened mind or rigpa, (presence) in Dzogchen. For most people, myself included, an experience of “that which is, but is not apparent”, is not enough to break the misunderstanding of reality, the fixation of separateness, and to cure”MeMineitis”. It takes time, familiarization with the state of Awakened Mind to break our habit of thinking we are separate, and the belief in a “solid” reality. That’s why retreat is so important. Retreat can take many forms. I did at least thirty group retreats of various sorts, as well as living at a Gompa, ( place of meditation) for two years while serving His Eminence Chagdud Tulku Rinpoche. Group retreats are a wonderful way to get your “feet wet” with the powerful experience of retreat. Solitary retreat is a very different thing. You are with yourself 24/7 and it can be intense at times. There are a number of ways one can orient to solitary retreat. You can do a set routine of Sadhana, or spiritual practices, which can take many forms I can’t go into here, or you can simply be with yourself, which is the form I chose and which Lama Drimed suggested would be fruitful. No books, no screens, no recorded music, no teachings, just being with oneself in the present moment. My Guru let me know I could do Yoga, play my flutes, and enjoy artistic expression. Lama Drimed told me to be on the lookout for the inner critic, and the “should-er”, that voice that suggests what you should be doing right now. The main “mantra” Lama Drimed gave me was to ask myself this question often, “what would I do right now if I loved myself?”. This question proved a very powerful one, as it brought me into relationship with my ability to love myself. It turns out, that to be able to accept and love oneself is crucial to the untying of the “knot” and the experience of that “which is, but is not apparent”. “That which is, but is not apparent” goes by many names. The followers of Siavism would call it Siva or Parama Siva, the Krishnas, Krishna, Hindus might call it Supreme Consciousness, or Ram or Vishnu, Muslims would call it Allah, you get the point. In Dzogpa Chenpo or Dzogchen, it is known as Awareness, Awakened Mind, or Rigpa. Awareness could be likened to the screen, so to speak, upon which the play of life is seen. That analogy falls short however because it’s two dimensional. It’s much closer to the truth to use the analogy of a holographic image. It’s three dimensional, arising in space, and its unique in that each piece of the image contains the whole image. The light is projected into space, so space is the container and the entrainer of the image. In Dzogchen, Awareness is likened to space. Space is incomprehensibly vast and everything we experience, including our every thought, is contained within it. Awareness and space are inseparable. In our normal lives the space/Awareness is forgotten in favor of the display. We love, or are challenged by the display, but the medium and creator of the display is Awareness, God, or any other label you want to apply to that which is beyond all labels. This medium, creator of the display, is the key to cure the disease of MeMineitis. It’s the great unifier, the “Canvass” so to speak, from which everything arises. So the path to experiencing the truth of that is to focus without focusing on Awareness/space, itself. The environment one chooses to practice this, is important at first. The place I chose was very important to the realizations I’ve experienced. 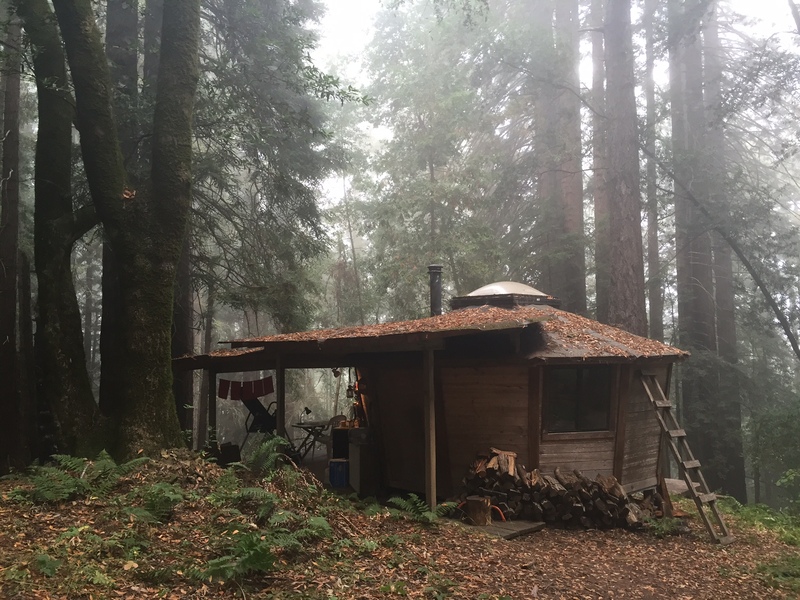 Lama Drimed found a yurt in a redwood forest (pictured above), not too far from his house, so I was able to drive a short distance to receive teachings from him and have him give course corrections as needed during the retreat. I also had good quality organic produce etc. a short drive from the yurt. I was self sufficient on every level, so this really helped with the nuts and bolts of my day to day existence. I would head to the store every 7 to 10 days to pick up supplies. This was an aspect of the retreat I feel helped me reintegrate back into my “ordinary” life after retreat. It showed me where I was at in terms of maintaining recognition of Awareness in the face daily activities. It also showed me how altered my mind had become through the meditation practices. This was very interesting to me, as I felt very high, almost like a marijuana high but different, clearer and deeper, with a sense of connection to everyone and everything around me. I didn’t notice it as much when I was by myself, as I gained familiarity with Awakened Mind and it became the “norm”. Lama Drimed has taught, and demonstrates, that with time in retreat it is possible to live from Awakened Mind in ones daily life. To experience the Truth of the interconnectedness of all of life in an ongoing way. The timeless state of Awakened Mind is available within the time-bound experience we have each day, it’s just difficult to access. So that is why I have made the pilgrimage to my retreat cabin the last two Summers, and why I will make that pilgrimage again next year. Underneath the neurosis, the many layers of confusion, I found a truly blissful, spacious, carefree being whose most essential quality is Unconditional Love. We are all, at our essence, an embodiment of Unconditional Love. Spending time with realized beings gives one the opportunity to experience the Truth of that, and solitary retreat is an opportunity to experience one’s own innate inner Enlightenment, one’s Unconditional Lover. May all beings have that opportunity. May all beings awaken to the Truth of who they are in essence.